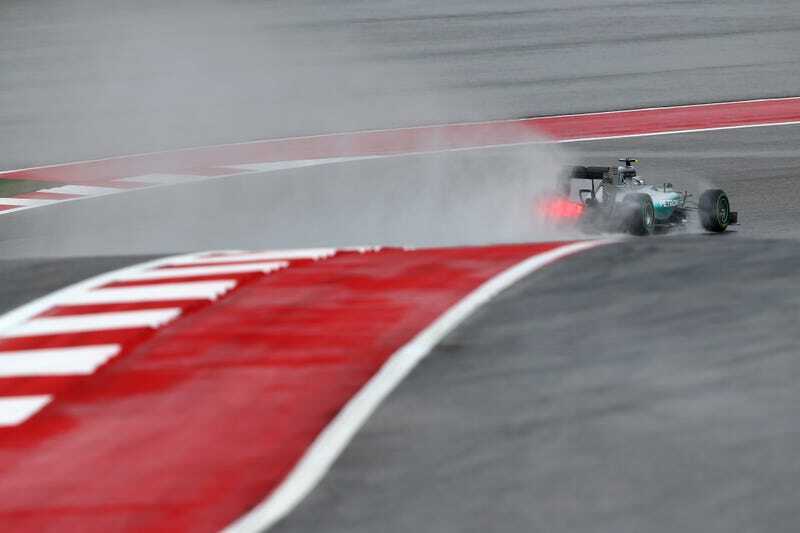 Formula One isn’t scared of a little rain, but a lot of rain — well, that’s a different story. We NASCAR folks don’t often (translated: never) see racing in the rain, so experiencing the first F1 United States Grand Prix practice session on Friday morning was a fun thing to watch — there’s just something great about watching water spray from behind a speeding car. But the things that occur off of the track are arguably even more interesting, from which tires teams choose to slap on the cars to how officials decide when conditions go from safe to unsafe. As for tires, we normally see two compounds of the dry-weather slicks out on the track when it’s sunny. Once the rain starts, teams choose between intermediate and full-wet tires, with intermediates helping in wet-dry conditions and the deep groves on full wets acting as draining mechanisms. And according to the description by Motorsport Director of Pirelli, Paul Hembery, intermediates are definitely preferable. “Typically, [intermediate tires] are what we tend to use more in wet conditions,” said Hembery, speaking over the sound of rain pelting rain as my feet were virtually submerged in water on Friday. “When we pass onto the full rain [tires] — which is what we would use in what we call ‘monsoon conditions’ — the reality is, it throws out nearly 200 liters of water a second. While drainage by tires doesn’t exactly sound ideal (for the trailing car, that is), Hembrey said that the design of Circuit of the Americas helps drain water quickly. The drying capabilities are a plus, but Saturday’s forecast looks even worse with rain chances hovering between 80 and 100 percent during the scheduled qualifying session — thunderstorms included. Once the sprinkle from first practice turned into a downpour on Friday, F1 officials called off the second session about halfway into its allotted time slot — for more than just the sake of the cars on track, according to Hembery. “You also have a lot of safety systems in Formula One,” Hembery said. “You have to have the helicopters that can fly in case there’s an incident and you need to be able to evacuate, and there’s also the safety of the stewards on the circuit. The race forecast is a bit more optimistic, with an 80 percent chance of light rain on Sunday morning. Hopefully so, Hembery. May the forc...ast be with us.